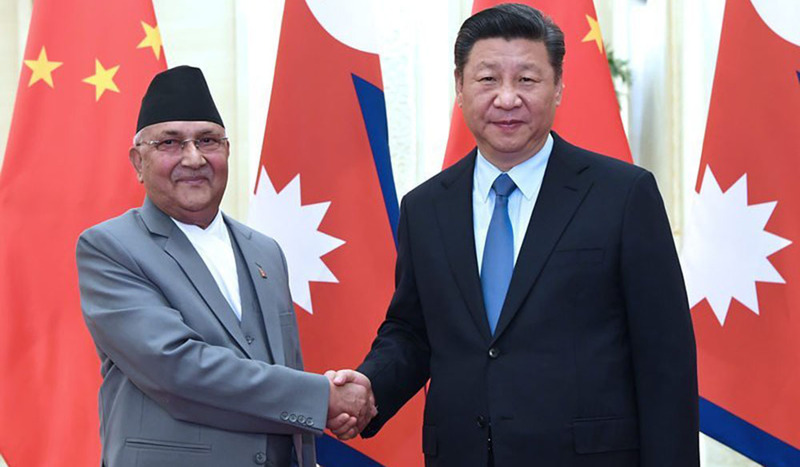 Beijing, June 21: Prime Minister KP Sharma Oli has said that political parties hold the key to development, prosperity and good governance, and they are the lead actors. They not only steer the present political course of a country but also shape its future direction, he said. In his speech, the Prime Minister dwelt on four main aspects: the role of party school in generating innovative ideas; role of political parties in ensuring governance and achieving prosperity; Nepal's own experiences in pioneering revolution and championing the cause of prosperity; and socialist movement in the global context. The PM also briefly spoke on the fundamental pillars of Nepal-China friendship and cooperation. I feel privileged to address this august gathering organized by the Central Party School of the Communist Party of China on the occasion of my official visit to China. This is my second visit as the Prime Minister of Nepal. I thank President Mr. Chen Xi and the whole School family for hosting this important programme to deliberate on such a pertinent theme. Let me convey warm greetings and expression of solidarity from the Nepal Communist Party to the General Secretary, His Excellency Mr. Xi Jinping and the entire party cadres and comrades of the Communist Party of China. My speech today will cover four main aspects: the role of party school in generating innovative ideas; role of political parties in ensuring governance and achieving prosperity; our own experiences in pioneering revolution and championing the cause of prosperity; and socialist movement in the global context. I will also briefly speak on the fundamental pillars of Nepal-China friendship and cooperation. A party school carries a special meaning in the context of the communist movement. It is a center from where new and innovative ideas blossom, a new generation of socialist workers are groomed and a new synergy emerges through a perfect blending of ideological awareness and collective wisdom. Building socialism does not happen automatically; rather, it is a planned, organized and envisioned mission. And to fulfill this objective, a right philosophical outlook and devotion is mandatory. A party school plays a critical role in this regard. I would like to commend the Central Party School of CPC for its role in orienting and shaping the minds of China’s emerging leaders. The contribution it has made in generating new ideas and policy suggestions has been significant. The CPC is strong because its 90 million party members are strong, both ideologically and organizationally. I am confident that the School will continue to make further strides in advancing the cause of ideological innovations, trainings and nurturing new regiment of cadres, to arm them with clear socialist outlook and integrity, and to respond to the new challenges that may arise in future. Please allow me now to dwell on today’s theme briefly. The emergence of political parties was the outcome of the democratic revolution against feudalism during the 18th and 19th centuries. The course that parties had to travel was not easy. They had to fight protracted struggles against various forms of authoritarian regimes to attain political freedoms. The history of the political parties so far has basically been the history of struggles and revolutions. The objective is clear- to materialize the long cherished desire of people for good governance and prosperity. The government is not an end in itself. For us, the representatives of the working class, the communists, socialists or lefts in whatever form, the government is only a means for serving the people, to transform society for betterment of the people and to deliver good governance to them. Political parties hold the key to development, prosperity and good governance. They are the lead actors. They not only steer the present political course of a country but also shape its future directions. There can be no other fitting example than China itself to understand the dynamics and interrelationship between a political party, governance and prosperity. The vision and the leadership of the Communist Party of China have been crucial in transforming the development landscape of the country. We are happy to see China’s unprecedented growth and development over the years. We are observing closely the progress made within the framework of 'socialism with Chinese characteristics under the leadership of President Xi Jinping. I believe that your two centennial goals have laid a strong foundation to achieve the ‘Chinese Dream of Rejuvenation. And, the realization of such a dream will have a huge significance for the socialist movements worldwide. The strong emphasis put on purity of party by comrade Xi Jinping in reinforcing his unwavering determination to fighting against 'tigers' and 'flies', and his strict instruction to the cadres to serve the people with integrity, reflect the CPC's clear vision on party's role in governance. Chinese determination is inspiring. It defeated the allegation levelled against communist parties by bourgeois forces that they can only make revolution, but cannot deliver development, or socialism and prosperity cannot move in harmonious way. CPC has made history by leading the revolution and materializing the long cherished dream of the people for prosperity. It is an inspiring movement for working class everywhere. Nepali people’s political struggle and movement has a long and glorious tradition. In early days, it emerged as a patriotic movement for country’s unification and against the British imperialist aggression. Prior to taking a clear political course, the movement took forms of social reforms and ‘humanist’ struggles against conservatism, superstition and discrimination. Later, it gradually grew stronger as a democratic movement against the autocratic Rana Regime. Nepali communist movement was born under the legacy of all these streams. Nepal Communist Party was established as a representative body of the working class in 1949, with clear objectives to end feudalism and establish people’s democracy under the guideline of Marxism and Leninism; protect national independence, oppose imperialist and hegemonic interference; and to build an equitable, just and prosperous socialist society. The seventy-year long history of communist movement has experienced highs and lows. Nepal Communist Party played an important role in overthrowing the Rana regime; led strong peasant movements; opposed foreign interference; and struggled for people’s rights in 1950s. It experienced painful series of division and disintegration in 1960s. The Jhapa Uprising ensued in early 1970s which proclaimed a bold rebellion against monarchy and laid a foundation for building and unifying the communist party on the basis of a new ideology. From the 1980s, a serious ideological discussion began on inventing a unique path of Nepali socialist movement. As a result, we propounded our distinct and innovative way for Nepali revolution under the leadership of comrade Madan Bhandari. Similarly, another group under Nepal’s Communist Movement emerged, which later organized as CPN (Maoist). International communist movement was facing an upheaval at the time when the ideology of People’s Multiparty Democracy was being propounded in Nepal. Communist parties pursuing armed rebellion had been facing severe setbacks. Apparently, the movement was facing new questions and challenges. Deviation and defection from Marxism would not have been the answers to those questions. Neither would the problem have been solved by dogmatic recitation of the classical texts. Based on the assumption of innovative use of Marxism, we focused on the distinctive attributes of Nepali society and practiced Marxism accordingly. This left an extraordinary mark in our society. The Communist Movement in Nepal was gaining popularity.Nepali communists emerged as the largest party in 1994/95 elections to run the government which was very successful, although its tenure was short. The idea of People’s Multiparty Democracy contributed enormously in popularizing the communist movement, establishing its legitimacy and steering the movement ahead amidst adverse circumstances on both domestic and external fronts. The credit for this goes indeed to the thoughts propounded by Madan Bhandari. The Maoist armed struggle began in February 1996. That decade-long struggle made important contributions in generating political awareness among the oppressed communities, and most importantly, advanced constituent assembly and republicanism as national agenda. After a series of discussions and debates between CPN (UML) and CPN (Maoist) on resolving the political problems in the country in the middle of the last decade, the basis of cooperation between the then seven mainstream parties and CPN (Maoist) was formed. first, the promulgation of Constitution of Nepal through a democratic process, incorporating the values of social justice, fundamental freedoms and socialism-oriented vision; and secondly, the historic unification between CPN (UML) and CPN (Maoist Centre) which resulted in the formation of the strongest political party in Nepal. Political attributes such as ideological direction- Marxism-Leninism, programme- people’s democracy based on multiparty competition and democratic values; main responsibility - socio-economic transformation and building a strong national economy with socialist orientation; and political direction- achieving supremacy through peaceful democratic means along with overwhelming mass support, have been the unique features of Nepal Communist Party. At present, Nepal Communist Party enjoys almost two-thirds majority in federal parliament, six of the seven provinces and majority of local governments. It has been established as a party with a strong political base of over 53% of popular votes. The people have given us the mandate to run the government for political stability and economic prosperity. Now, the government has concentrated all its efforts on economic development with the motto “Prosperous Nepal and Happy Nepali”. Our destination is clear- development of socialism with typical Nepali attributes. Our priorities are clear- enhancement of nationalism, institutional development of democracy, strengthening of national unity on the basis of social harmony, achievement of social justice and equality by ending all forms of discrimination, inequality and suppression and attainment of economic development and prosperity within a short period of time. We put emphasis on good governance encompassing such components as accountability, transparency, austerity and eradication of corruption as its key features. We believe the success of our movement in Nepal will be something which all the Communists worldwide can cherish. Our topmost priority, at present, is to attain economic prosperity to match our political achievements. Our policies and programmes aim at preparing a foundation for socialism. Our vision is to establish people’s government through peaceful means of democratic competition. Given these contexts of our two countries, I believe that we have our own unique ways of pursuing socialism. However, our goals, objectives and strategies have many similarities. The developmental aspirations that we strive to fulfill are guided by similar vision. And, more importantly, we are guided by the common spirit to uplift the disadvantaged, oppressed and the poor people. Thecontemporary world is characterized by conflicts, contradictions and paradoxes. The world today is witnessing inward-looking tendencies. The identity politics is apparently seen as undermining the fundamental goals of ideologies. Ethos of class struggle is being undercut by racial, cultural and ethnic issues. Amidst these global realities, communist/socialist movements around the world have evolved through different forms and structures. Not all of them are at the same stage of revolution. Some have completed the socialist revolution while others have made political gains but are yet to achieve economic goals. Some revolutions are in the phase of mobilizing people in order to materialize the dream of socialism. Therefore, it is obvious that the role of political parties also changes according to the stage and the form of a ‘revolution’. And, we must understand that no political party can advance the socialist cause, if it is detached from the political realities of a country. It is in line with this notion that we have taken recourse to competitive multiparty system in Nepal. We have localized and contextualized Marxism and socialism as per our unique and distinct needs and challenges. First, we have been careful in ensuring that the real revolutionary spirit and ideal does not fade away. We are aware of the danger of complacency and deviation that might arise in party workers along with our success in party politics. As Chairman Mao once said that the comrades who were not defeated by the enemies with guns could be defeated by sugar-coated bullets of luxury, inertia, corruption and arrogance. I believe both Nepali and Chinese versions of socialism have internalized this spirit. Second, we are mindful of the fact that capitalism and bourgeois culture can derail our movement through a discourse of capitalism-guided progress of society. We have witnessed that capitalism can enrich upper strata of society, and neoliberalism can facilitate class-transformation of a handful of people, but it cannot provide the answer to the quest for just, equitable and people-centric development. Real progress that people can feel is only possible in socialism. Third, there is a constant need of educating, orienting and guiding the party cadres and workers so that they do not deviate from the original principles, ideals and visions. Our focus should be on the younger generation, which has enormous vigor, energy and innovative strength. But, the influence of global capitalism which is spreading offensively intends to inject in the youth the culture of individualism, consumerism and alienation from the social responsibilities. We should take care in bridging the gap between the veteran generation seasoned in revolution and the vibrant youth generation. Fourth, protection, promotion and innovative implementation of Marxism is vital. We must always be open to new ideas and thoughts. This is where innovation and creativity prosper. Chinese comrades very often talk about the three major ideological junctures in the Party’s history- seventh national congress of the CPC and adoption of Mao Zedong Thought, which led the creative innovation of Marxism in China; policy of openness and modernization by Deng Xiaoping, which heralded a new era of development in China; and the vision of 'Socialism with Chinese Characteristics' and Xi Jinping Thought for a New Era. In Nepal, we also have similar experiences and benchmarks of ideological innovations. The Jhapa uprising of 1970s, which opened up new pathways to reorganize and revitalize the then fragmented and divided communist movement, the rise of peoples' leader comrade Madan Bhandari and his new ideological innovation -People's Multi-Party Democracy, and the historical unification of the CPN (UML) and CPN (MC) are such major benchmarks of our movement. Lastly, and more importantly, no political party can sustain and contribute to the social progress if it misses the vital links with the people it serves. It is only with the support of the masses that political parties can succeed in transforming society and delivering good governance. This is manifested well in the success of Communist Party of China and its contributions to the country’s phenomenal development and prosperity. We too are making every effort to reach out to the people to hear their voices and put ourselves under the scrutiny of the people. We have adopted competitive multiparty system of governance with constitutional supremacy, periodic elections, human rights, check and balance as well as separation of powers, and independent judiciary, among others. Such appropriation in our communist movement is to address the heterogeneous and diverse socio-cultural edifice of Nepali society. We respect diversity and plurality but remain committed to the thrust of Marxism. The role of a communist party is unique and special like a torch bearer. It has led the revolution and will pioneer the socio-economic transformation and prosperity in respective countries. That's why, the leading role of the communist party is necessary for prosperity and governance. We think such a role can be obtained through competition and initiation. To conclude, there can be no single formula for political parties to follow. For them to champion as the agents of development and good governance, they must internalize the revolutionary spirit with a sole objective of serving the common people and their aspirations. The idea that can change the world today is not completely different from the one that changed the world in the past. It is a constant process of modification, adjustments and re-adjustments. Our unique and distinct models of socialism are examples of such innovations and adjustments. Nepal-China relations began with traders’ caravans crossing the current borders millennia ago. Although diplomatic relations between our two countries were established as recently as in 1955, the time-tested, friendly and cooperative relations have been the hallmarks of our bilateral relations. The narratives of people crossing the Himalayas for progress, wealth and prosperity still abound in Nepal. The travelogues of Faxian, Buddhabhadra and Xuan Zan as well as the stories of Bhrikuti and Araniko support this historical interface between our two peoples not only at political and economic spheres but more also at social and cultural domains. Such engagements from time immemorial have nurtured mutual understanding and respect. They have also helped us know each other’s needs and interests. This, in turn, has inculcated in us the values of peace and harmony in a diverse society. Lord Buddha’s teachings on peace and harmony have profoundly guided the socio-cultural ethos of our peoples. Panchasheel – the five principles of peaceful co-existence - guide our friendly and cordial relations. We take pride in pursuing these principles for achieving peace and progress in a harmonious way. The Chinese Government and people have always supported Nepali people in fulfilling their aspirations for peace, progress and prosperity both in normal times as well as during crisis. We are appreciative of such support and cooperation. Finally, I once again acknowledge the tremendous contribution made by the Central Party School of the Communist Party of China towards promoting socialist goals and principles. The ideas and education it provides have been useful in building socialism and promoting its linkages with the common people. This is where we see the relationship between Communist Party of China and the country’s remarkable progress and development. I express my best wishes to the School for success in its mission and future endeavors.